Perfectly manicured nails is one of those little beauty details that I've always admired in put-together people but something that I've never adopted. Sure, I'll fall madly for a colour and attempt to snazz up my look but the combination of work plus the easy chip factor often made me feel defeated. 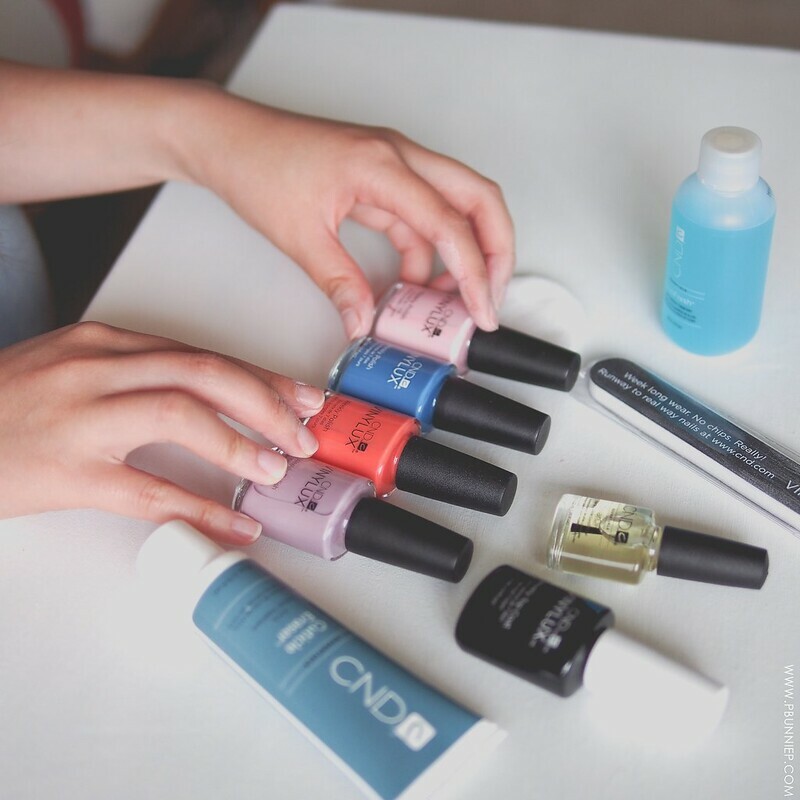 In perfect timing, the team at CND recently released their 7 Day Wear Vinylux collection and put together a little manicure package for me to try out. So, let's go! 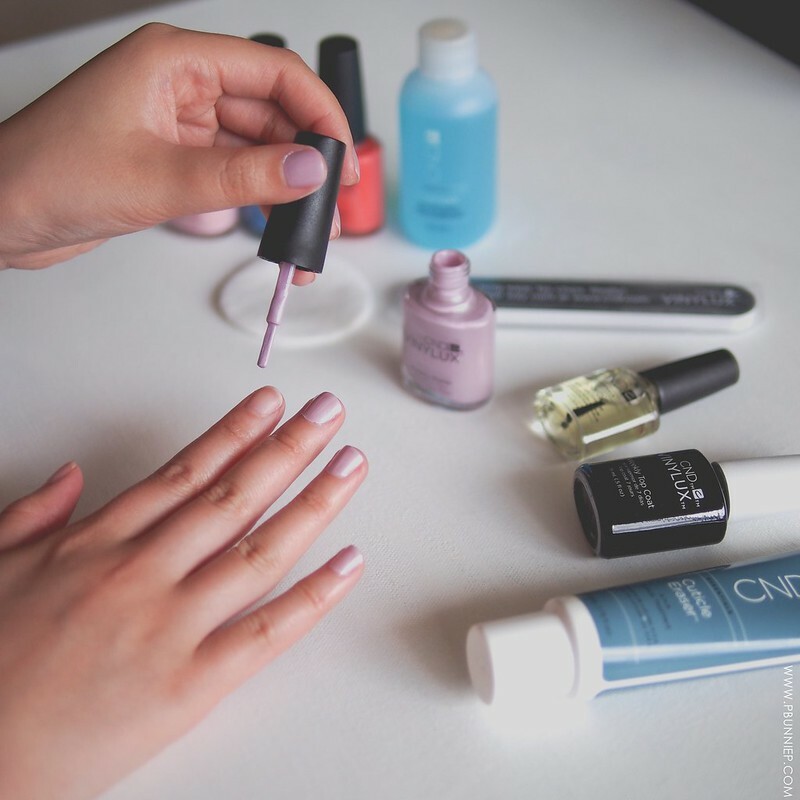 After a quick shaping of my nails, I started with a dot of the CND Cuticle Eraser* which feels like a light moisturizing lotion but it contains micro-AHAs to help exfoliate dry skin around the nail. 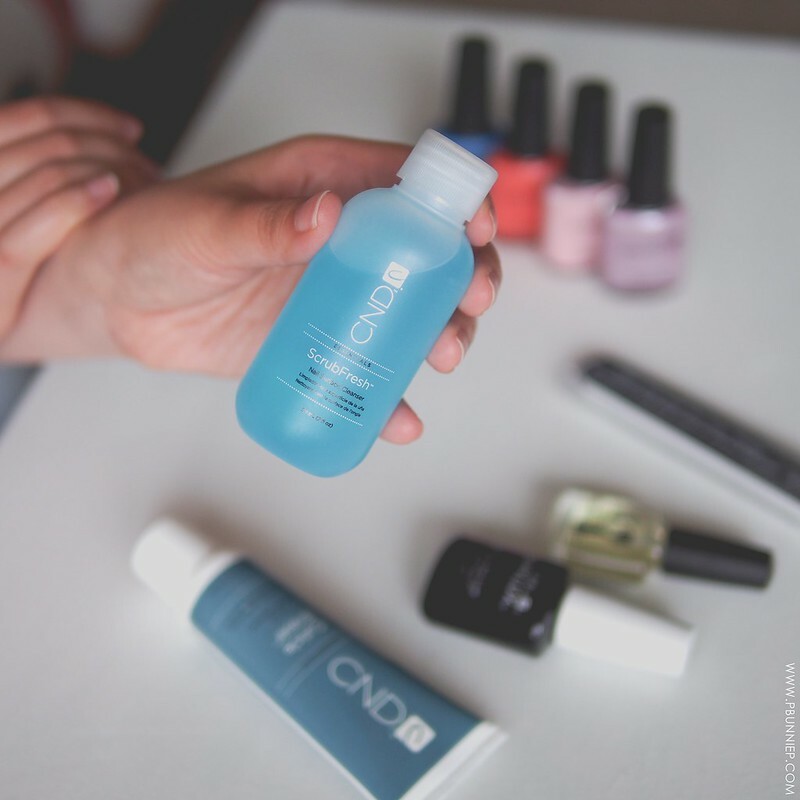 Next came CND Scrub Fresh* which is a prep step to help remove any oily residue and make sure the nail plate is nice and dry for the best adhesion of the polish. Now this seems common to most nail prep products and sure enough the ingredients is a simple blend of acetone, alcohol and colourant so it's certainly replaceable by any regular acetone remover you may have on hand. TIP: To make sure you're not removing the previous product, I recommend using a q-tip around the edges of the nail plate or using small piece of cotton wool. Debating between four equally lovely shades (I mean really, they're all very wearable), I ended up opening #216 Lavender Lace*. This satin finish colour contains a fine silvery shimmer that plays on the metallic trend while still remaining perfectly demure - I was actually pleasantly surprised at how nice this looks with my skin tone and have been fondly examining my nails since putting this on. 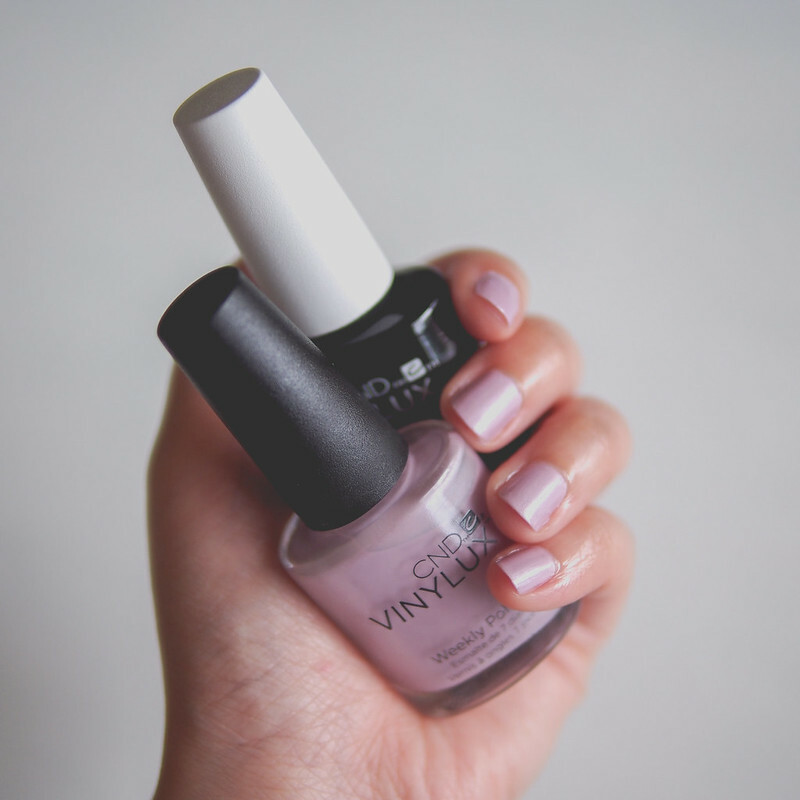 One thing that immediately impressed me with the Vinylux formulation is the foolproof, super smooth texture and the two coat coverage which means even the nail novice can be successful. Note: The collection does come in sheer, semi-sheer and opaque finishes. Lavender Lace is opaque. 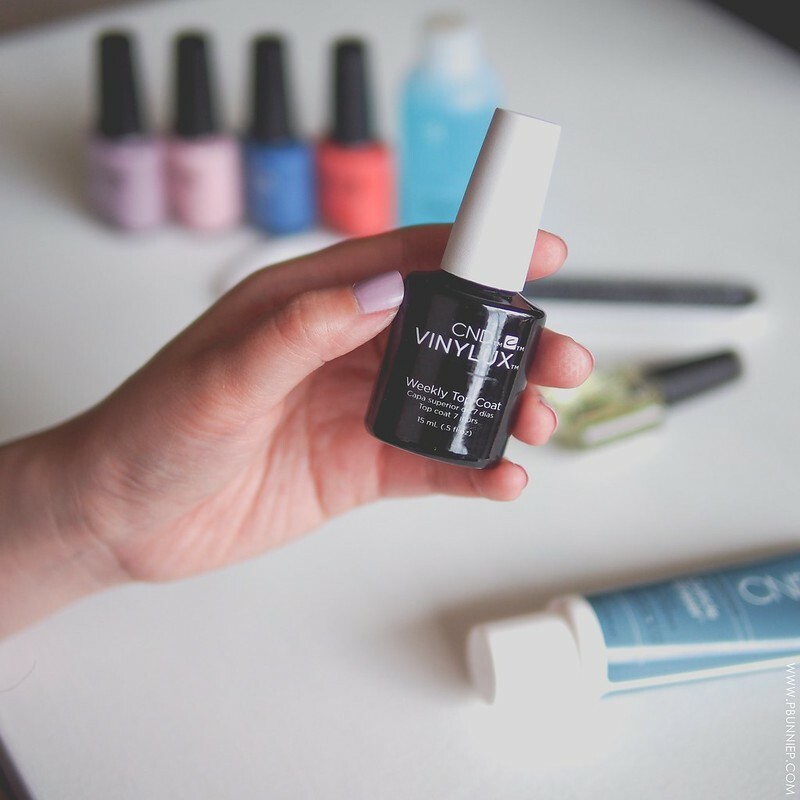 To seal in the one week deal is the CND Vinylux Weekly Topcoat*. With my past experience using high shine, long wearing finishers, I was completely expecting something thick or even gel-like which is a super popular nail trend right now anyway. Unexpectedly, this topcoat had great flow, a light consistency and is self-leveling for a smooth finish with minimal work. And while I didn't find it enhanced the shine of my finished nails, it was very fast drying and CND claims its formulated to strengthen overtime with exposure to natural light. Now the countdown begins. I'll be coming back and adding my one week thoughts to this post but so far I've been very pleased with how easy the polishes were to work with, the quick drying time and the perfect coverage. Admittedly I'm not a very coordinated self-manicurist but looking at this now, it has to be one of the best results I've done in a very long time. With 114 shades to choose from, it could be a major wardrobe-matching staple! UPDATE: Feb 2017 | After many frequent wears, I can say this is still my favourite long wearing polish to date. Despite being very harsh on my nails from frequent washing, crafting and general housework, Vinylux just pushes through to Friday before it becomes completely unbearable. If you are a generally lighter on your hands/nails, I think a 7 day wear is certainly doable. The combination of easy to use, smooth formula and beautiful colours make this my current go-to day to day polish.